Talking of the overtly riot politics of the RSS and the contradictions of the party she leads in her constituency of Belapur, Manda Tai makes a startling revelation: “Mere ko Sangh wale bol rahe the ki Muslim masjid todo ye karo. Main boli sorry main ye nahi kar sakti. Masjid sthal sab kachre ke maafiq dekhte hain. Itna log ko hum hay nahi le sakte hain kyonki aadhe log apne se jud gaye hain apni sarkar se jud gaye hain abhi wo Pasha Bhai hain lakhon kee zyajaad daalte hain apne BJP ke Modiji ke Amit Shah bolo kaise kuch kar sakte hain aur apne karyakarta ke paas ek paisa nahi hai aur apni BJP har baar kuchh kamane nahi de rahi hai toh kahan se layenge barhiya poster programme pe programme deti jaa rahi hai karo karo karo (The Sangh people were telling me time and again to destroy the masjids of Muslims. I told them ‘Sorry I can’t do that.’ They all look at a masjid something like trash. I cannot afford to earn so much ill-will of all those people [by resorting to such hate] because many Muslims have joined the BJP. They are now part of the government. There is this Pasha Bhai, for instance, who is donating fortunes to the party at the behest of Modiji and Amit Shah. So, how can you harm them? Then our workers have no money and the BJP is not allowing us to earn anything. So from where all these fancy posters materialize? They just float a programme after programme telling us to implement them all).” She is unstoppable. Referring to the headache Jignesh Mewani, Alpesh Thakur and Hardik Patel caused them in Gujarat, she says: “Isliye toh kitna teen bacchon ne dum chhak kara diya (That is why three kids had squeezed their breaths out there).” Yes, in Gujarat, the journalist tells her. “Kyon kara dee, kyon Pappu karna hai kya zaroorat kya hai. Abhi toh Congress hai bhi nahi. Yahin main aur Ganesh Naik mein jhagda hai yahan baaki kuchh nahi hai aur mujhe kisi kee zaroorat bhi nahi hai. Main usase saksham hoon ladne mein. Uske bahut saare mandir hain uske teen mandir tootane ko aaya apne BJP sarakar usko bacha rahi hai. Kyon bacha rahi hai. 400 crore kee jageh acquire kee ek mantri ne aur BJP sarakar usko bacha rahi hai mandir ke liye aur uss mandir mein bhagwan bhi nahi hai (How were they able to do that? Why should we bother about Pappu? Where is the need? There is no Congress [in power] right now. There is an ongoing tussle between me and Ganesh Naik here. There is nothing else to worry about and I don’t need anybody to help me. I am able to handle him. He owns many temples. Recently, when three temples [owned by him] were about to be demolished, the [Maharashtra] BJP government came to his rescue. Why it is doing so? A [former] minister [that is Naik] has acquired land worth Rs. 400 crore and the BJP government is trying to save his temples and then there are no gods installed in those temples),” Fumes the Belapur legislator. Manda Tai is talking about the alleged illegal encroachment of government properties in Belapur and Pawane under Brihan Mumbai Municipal Corporation by Naik’s family members. A PIL was also filed in the Bombay High Court in 2013 by an RTI activist in this regard. 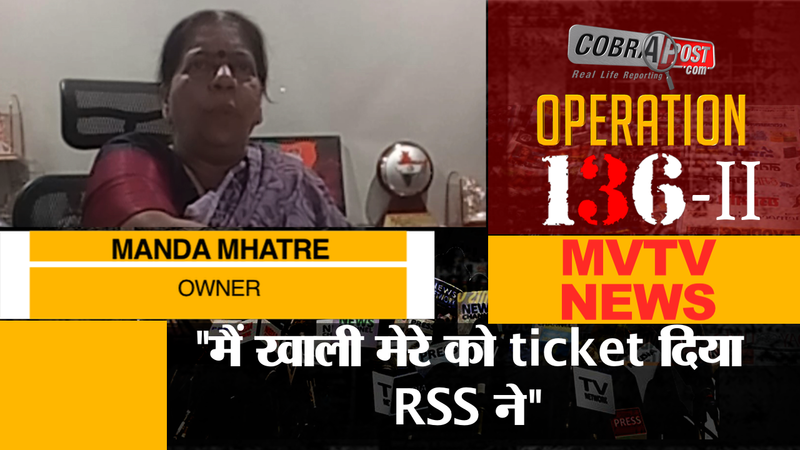 After revealing the communal face of the RSS, Manda Tai also tells us how a RSS leader helped her secure a BJP ticket in the last state assembly elections, which she won by defeating the sitting NCP minister Ganesh Naik.